Dr. Vincent J. Nunno, Dan Bon 7291, Sam Dan. 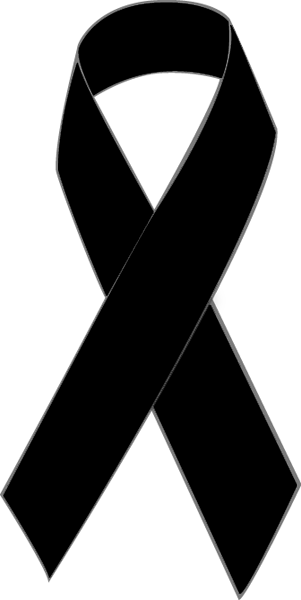 It is with great sadness I tell you the news of Dr.Vincent J. Nunno's passing–he held a third degree Black Belt and was starting work on the 4th. He was an active member of your organization up to the time of his illness and took much pride in the organization and all it taught him. 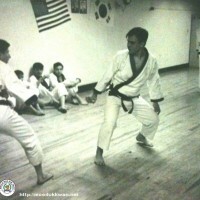 He became a Moo Duk Kwan teacher in New York in the 70's, teaching children and adults, and even taught his own father! He instilled a love of the martial arts in our son. I hope the conference is excellent–I knew we would have been there. The news of Dr. Nunno's passing is indeed a sad occasion for many of us. 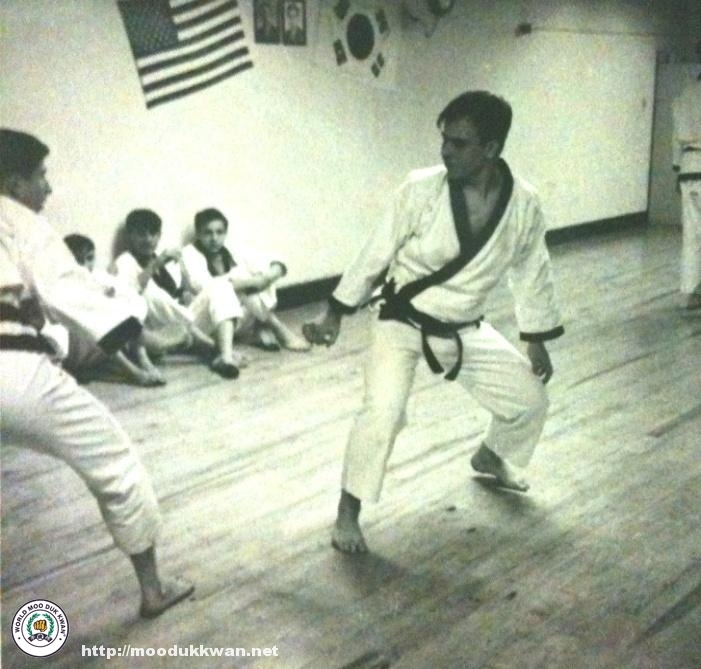 Many in our organization are not aware of the impact he played in developing the Moo Duk Kwan® in New York City and in New York State. As a former student of Dr. Nunno, I remember his tough workouts and his wise instructional guidance. 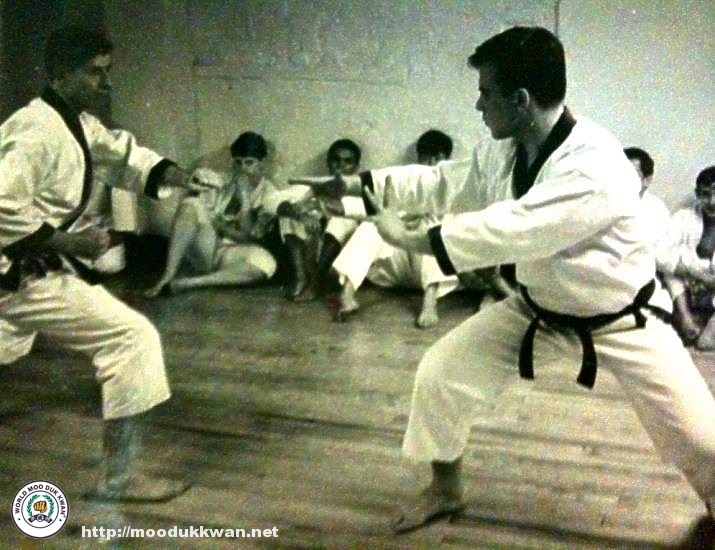 As a former member of the Five Towns Karate Center in Lawrence, New York, I was privileged to have tested and trained under his guidance in 1968 – 1971. I made Cho Dan under his guidance as well as under the guidance of Dr. Robert Sohn and Mr. Michael Masley (my original instructor). 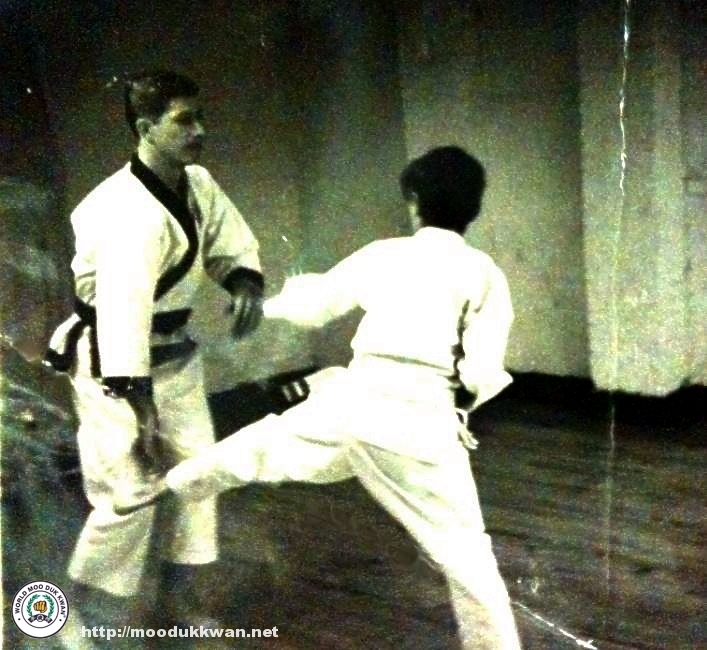 We (former members of the NY Moo Duk Kwan and Five Towns Karate Center) have been gathering stories of those early days of training in Soo Bahk Do (Tang Soo Do) Moo Duk Kwan® and there is a current plan to publish a small history of those times. The current owner of Five Towns Karate, Master Dan Segarra has organized and contacted many of our former members, and it is unfortunate that we did not get to contact Dr. Nunno sooner. I would love to include Dr. Nunno's legacy as part of that history. If you read this small memorial, please contact me directly at rob29085@optonline.net so you can share any stories he may have shared with you of those early pioneer years that influenced so many of us. Our sincere condolences, we have lost a well respected pioneer of martial arts and he will be missed. The communication above serves only to remember the great contributions of a wonderful Martial Artist who lived the Moo Duk Kwan® philosophy and taught the art of Soo Bahk Do® . 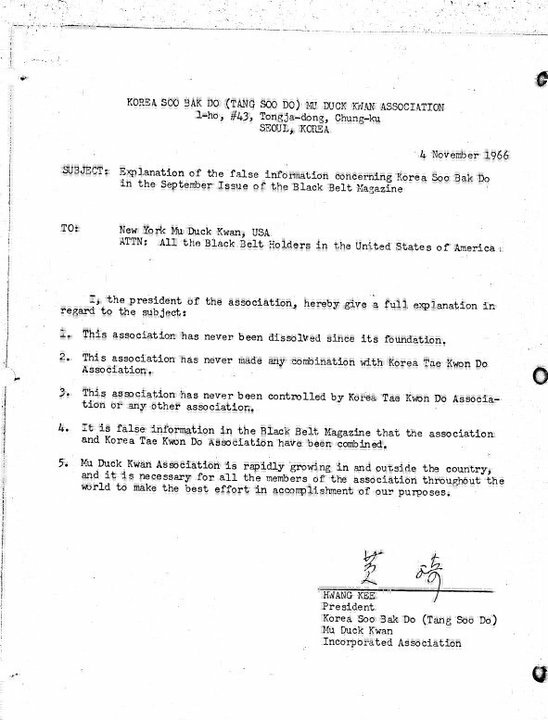 He along with Dr. Robert Sohn, Master Eugene Perceval, Dan Bon 7954 and Master Ed Gross, Dan Bon 6780 were the appointment officers for the New York Moo Duk Kwan Tang Soo Do (Soo Bahk Do)® Association, by the Founder and Kwan Jang Nim Hwang Kee in 1967, see the historical document below. 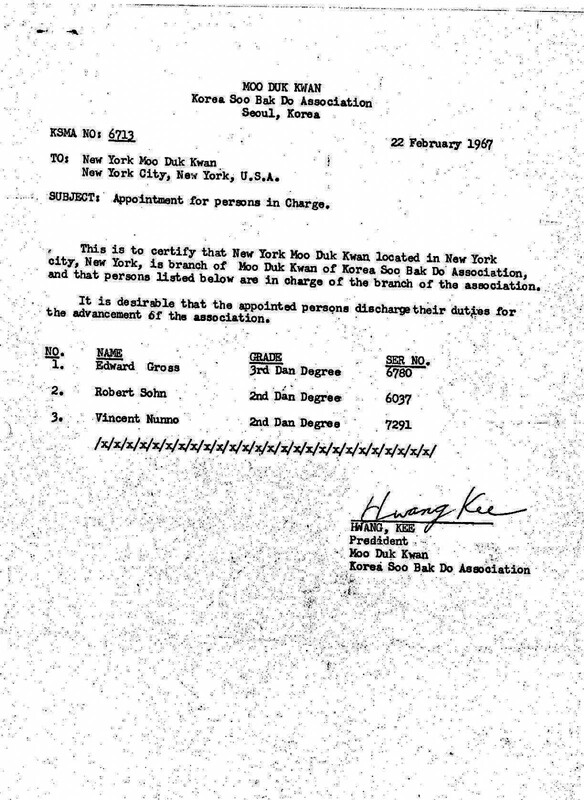 This document is courtesy of Master Eugene Perceval, Dan Bon 7954, who was the secretary of the NYMDKTSD Association in the 60's. He kept most of the testing documents and material from those early years, and we thank him for that. And credit must be given to Dan Segarra, Owner and President of the Warrior-Scholar Academy who published the documents and provided me with copies. Thank you. Master Eugene Perceval sparring with a Gup member. Another sparring photo with Master Eugene Perceval and Mr. Vincent Nunno. 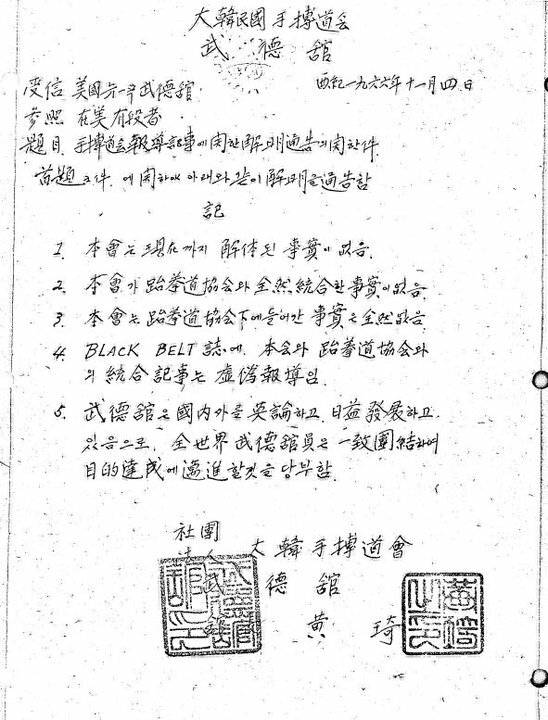 It is interesting to note, that there was some correspondence from the Founder/Kwan Jang Nim Hwang Kee in the 60's disagreeing with an article published by Black Belt Magazine that the Moo Duk Kwan had united with the Korean Tae Kwon Do Association and was considered one organization. 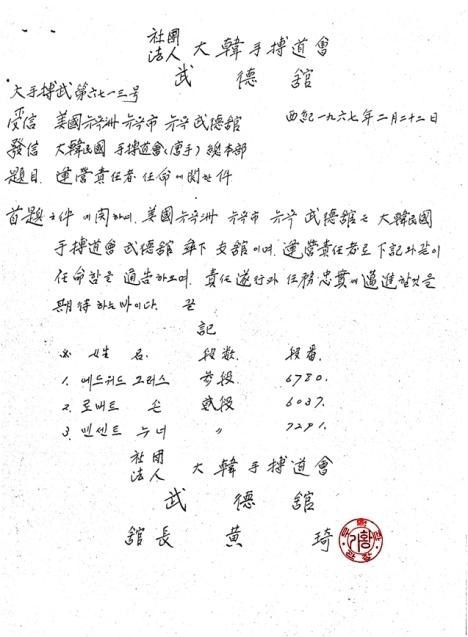 The Kwan Jang Nim wrote a letter to all Soo Bahk Do Moo Duk Kwan members stating that the Korean Soo Bahk Do Moo Duk Kwan had never united with the Tae Kwon Do Association and that the report was false in nature and content. Below is a copy of that correspondence. I believe Korean version and its translated version.